Once the summer walleye fishing begins to slow, In The Net Charters packs up and heads to beautiful Frankfort, Michigan for summer salmon. 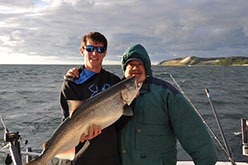 This is your opportunity to catch big Lake Michigan King Salmon. 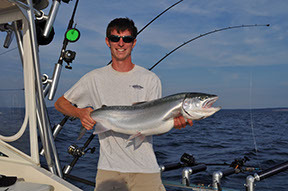 The King Salmon offers one of the best fights in the Great Lakes. Fish range in size from 12 to over 20 pounds with battles taking up to 20 minutes. Come join us for this scenic trip with beautiful views of Sleeping Bear Dunes and Point Betsie Lighthouse! South Manitou Island is located about 25 miles northwest of the Port of Frankfort, Mi. 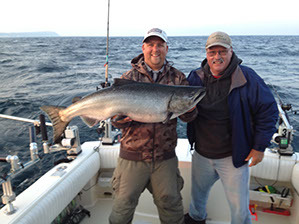 The island provides excellent structure for large numbers Chinook salmon. 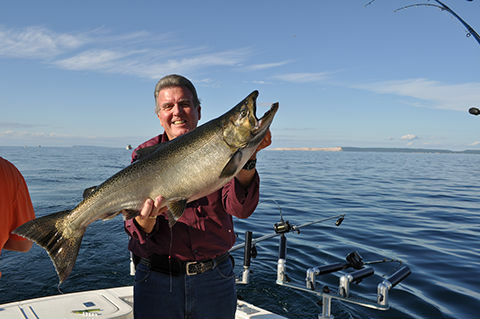 The trip is a unique Great Lakes fishing adventure. The boat ride to the island takes us by scenic Point Betsie, Sleeping Bear Sand Dunes and the shipwreck of the Francisco Morazan. 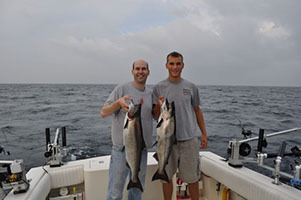 The distance to the island keeps most fishermen away and provides a serene fishing experience with some of lake Michigan’s most beautiful scenery. Looking for the big water experience but can’t get a big group together, we can help. In The Net Charters specializes in small groups of 2 to 4 guests, with a level of comfort that’s typically only found on bigger boats. Our 25ft Carolina Classic features all the latest in tackle and equipment. Downtown Frankfort is a great place to check out. There are several local shops, and great restaurants with something for everyone. The town is great for an afternoon walk. Check out the mineral springs, located just before downtown. Don’t forget to make it to the pier and check out the lighthouse and beach. Swimming is available inside the pier heads or in Lake Michigan. Make sure to catch a Lake Michigan sunset at the lake shore, a view you won’t soon forget.